As some of you will have heard by now, I didn't receive the Creative Scotland grant funding I applied for. I went for two grants: one to travel to Malawi a first time to take photos and to teach etching workshops, and the other to take the exhibition back to Malawi to exhibit it there. I first heard that I hadn't got the exhibiting grant, and I was gutted. After that, I was expecting not to get the other grant, so it didn't come as much of a disappointment when I didn't. Creative Scotland gave me useful feedback. With the 'first trip' application,they gave me very encouraging feedback even though I didn't get the grant. They said it sounded like a wonderful project and that they believed in it and thought I'd written a great application showing that I had good public support. Unfortunately, they had a fund of £1.1 million, and were over-subscribed in applications by £2 million. With those figures I wasn't surprised that I didn't get a grant. I have no experience of managing projects on this scale and have never received a grant from them before. But, this left me in a financially scary position. I sat down and calculated what the absolute minimum project costs would be. It came to £8000: £3000 for each trip to Malawi, and £2000 for the community exhibition costs. I had already planned to crowdfund for the £2000, but a second self-funded trip to Malawi would cripple the family finances irrevocably so the exhibition trip would have to be scrapped. A few friends told me to fundraise by any means possible, that they would help, and that it was a great project and that the money could be found from somewhere. I could do cake sales, raffles, dances etc. and bring money in. I felt it was unfair to ask family and friends to help me fund the project when I was already relying on their help to raise the crowdfunding total. But I had to come round to the idea. I'm not earning any other money this year because I'm too focussed on this project and I don't like relying on the my husband's wages to fund my work. It's bad enough not bringing income into the household, without being a drain on our other resources as well. I am a committee member for the artist's Open Studios North Fife, so I asked the participating artists if they could offer an artwork/art related gift to me to raffle off for funds. So far 20 artists have offered work, which is wonderful. 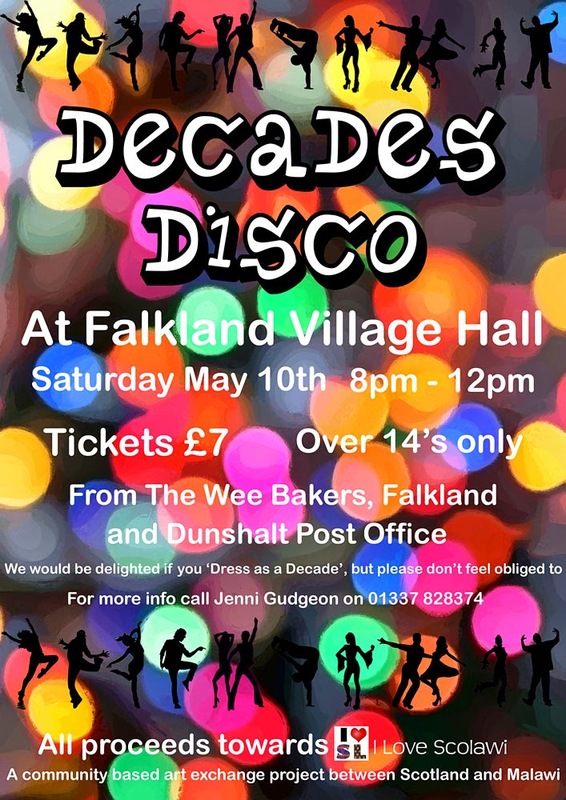 I've applied for my small lotteries licence and I'm keeping my fingers crossed that I will have received it in time for my fundraising Decades Disco at Falkland Village Hall on 10th May. Various people have let me know about other charitable foundations I can apply for, and I've been encouraged by Diana at FCAC to reapply for the grant to exhibit the show in Malawi, as the feedback from that application mentioned a few areas I lacked information for. and can make better. I'd like to thank my friends and family who've refused to allow me to wallow and give up, and who have offered me so much love and support over the last few difficult weeks. I'm now re-enthused about making I Love Scolawi happen and I'm ready to take on the world!